Heraldry existed in Scotland by the last quarter of the twelfth century. In 1672, the Scottish parliament passed a law that set up the “Public Register of All Armorial Bearings of Scotland”, which is usually called the Lyon Register. All heraldry in Scotland is controlled by the Court of the Lord Lyon King of Arms at New Register House in Edinburgh. Unless a coat of arms is registered here, it has no legal standing in Scotland. The current Lord Lyon King of Arms is Sir Malcolm Innes of Edingight. A coat of arms in Scotland is considered inheritable property and can only belong to one person at a time. Clansmen actually have no legal right to the coat of arms of their chief. If you use the arms of someone else then you are usurping arms, if you make up your own arms, then you are using bogus arms. In both cases you are committing a legal offence. For those who have not inherited arms, it is possible to obtain a coat of arms through Lord Lyon King of Arms. The shield is the basic minimum for a Scots coat of arms. Coats of arms can also include the crest, motto, supporters (typically two) and other elements. There are different styles of helmet that can appear on coats of arms, designating different ranks. The mantling and wreath are of the main color and metal of the coat of arms. The shield on the Countess’s coat of arms features three stars that indicate a descent from the old rulers of the Province of Moray. The Mackays, the Murrays and the Inneses also claim descent and have coats of arms that include or have included the three stars. The silver helm with garnished with gold and with gold grilles indicates the rank of peer. Due to royal connections, in 1719 the Earls of Sutherland were granted the heraldric symbol of royal alliance in the “double tressure flory counter flory” to their coat of arms similar to that which surrounds the rampant lion in the royal arms. The Coat of arms also features the crest or badge of the chief, a wildcat sejant erect guardant proper; the clan motto, “Sans Peur”; and two supporters denoting the rank of chief. A chief has the right to wear the crest as a badge either with or without a circlet and three eagle feathers. A chieftain, head of large branches of a clan and recognized as such by the Lord Lyon King of Arms may wear the crest as a badge with two eagle feathers. An armiger, or someone with their own coat of arms, may wear his own crest as a badge with or without a circlet and one eagle feather. For those of Scottish descent who do not have their own coat of arms, there is a perfectly acceptable way to have some heraldic display. This is the wearing of the crest from the chief’s full coat of arms with a surrounding belt and buckle containing the motto of the chief. This badge proclaims that person to be a member of a particular group. In highland dress, the belt and buckle badge is worn as a cap badge, on kilt pins, as sporran ornamentation, etc. 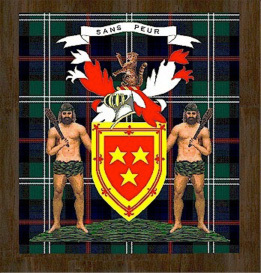 The motto of Clan Sutherland is “Sans Peur,” which is French for “Without Fear.” It appears on both the Countess’s Coat of Arms and the Clan crest as mentioned above. More than a symbol like the thistle, the plant badge was also used as a means of clan identification by a sprig of the plant being worn on the hat. This is illustrated by an incident at the end of the Battle of Culloden. Cumberland’s men were going around the battlefield bayoneting the wounded highlanders. When they came upon on highlander, he said, “Hold your hand! I’m a Campbell.” Their reply was “Sorry, we couldn’t tell. You’d lost your bonnet.” The Sutherland Plant Badge is Cotton Sedge; Butcher’s Broom is also used. This refers to the Clan’s gathering place in Golspie, at which is the Gathering Stone. 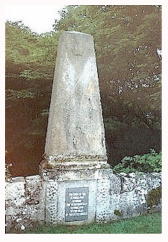 The inscription on the lower part reads in English,”The Chief of the Sutherlands Summons the Victorious Clan Sutherland to The Head of the Little Bridge.” There is also an old inscription on the top part that is in Gaelic.